Israeli VC on Sand Hill road: Thanksgiving in Israel ? i miss watching the Macy's day parade.... how great would it be if we could stream it live and have it projected onto the wall to be in the background while we eat? As an American oleh, I know many American immigrants continue to celebrate Thanksgiving in Israel, but it's interesting that you - an Israeli who spent time in the US - would observe it in Israel. Why? Thanksgiving is one of those holidays that just "gets to you". A friend of mine who lived in Silicon Valley for 14 years said, that when she was living in the US, she felt no connection to the holiday. But as soon as she moved back to Israel, she missed it. For me, since I've spent half my life in the US and half in Israel, it's always been a part of me. Even my Israeli husband was so excited about Thanksgiving when we celebrated it for the first time in Israel. 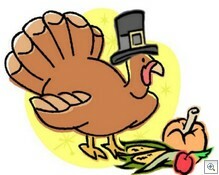 Maybe it's the turkey, maybe the decorations or pilgrims. I think it's just spending the time with your close friends, for no reason other than enjoying company with some tradition. I intent in the future to make Aliyah, and just this year I had firmly decided that Thanksgiving will be coming with me. The wholesome notion of a day of getting together with family and bonding has meaning on both hemispheres. I have a solution for the football games/Macy's Day Parade issue that you might consider utilizing. I have friends that have an apartment in Jerusalem (haven't made the full move yet) and they keep a sling box in the states connected to a cable line (a sling box lets users watch live television over the Internet. Users can change channels as though they were in front of the TV. The Sling Box is affordable ~$100 for a basic one, and with a simple s-video cable, you can put the television broadcast on your tv from your laptop). This set up can allow you to watch the Thanksgiving Day Games and the Parade. Enjoy. Sorry this is late.